The prime minister, David Cameron, has launched a number of measures aimed at improving integration among Muslims – in particular, Muslim women – in the UK. Polls show that around 70% of people don’t think Muslims are well integrated into British society and concern that Muslim people living in Britain do not feel British has long been part of broader discussions around extremism. So, now seems like a good time to take a closer look at how British Muslims actually feel about their place in society and to explore the link between segregation and extremism in greater depth. Along with Professor James Nazroo, I conducted research into these issues using nationally representative data, collected in 2008/09 from almost 5,000 people with different ethnic and religious backgrounds, as a part of the Home Office Citizenship Survey. We found that these ideas about British Muslims are not backed up by evidence. I personally feel a part of Britain. You can see the participants’ responses in the graph below. It’s clear that almost everyone in the religious and ethnic groups examined feels a sense of personal belonging to Britain. And those who didn’t were as likely to be Christian as Muslim. How strongly do you belong to Britain? More than 80% of people in each of these groups said that they strongly belong to Britain, with the narrow exception being Asian Christians. This suggests that feelings of alienation are not as widespread within the Muslim population as many in the wider community appear to believe. And it indicates that – where it does exist – alienation is not unique to British Muslims, but also extends to other ethnic and religious groups. It is possible to fully belong to Britain and maintain a separate cultural or religious identity. As the graph below demonstrates, with the exception of Caribbean Christians, at least 75% of people in each group perceived no incompatibility between fully belonging to Britain and maintaining other cultural or religious identities. From these initial responses, it was clear that respondents in Muslim groups were just as likely as other groups to respond positively to the statements about belonging. But we also considered it important to take other factors into account. So we explored whether there was any evidence of an association between the respondents’ sense of belonging and their age, gender, economic activity, place of birth and risk of racist victimisation. We calculated and compared the likelihood of reporting a very strong sense of belonging to Britain, feeling part of Britain, or strongly agreeing that “it is possible to fully belong to Britain and maintain a separate cultural or religious identity”, for each of these other factors. We found an association between a sense of belonging and four of the five factors: age, gender, place of birth and risk of racist victimisation. Let’s start with age. On the whole, younger people were significantly less likely to feel British than their older counterparts. At first, this seems to align with the well-worn idea that young people – and particularly young Muslims – face a greater risk of radicalisation. It would also seem to contradict another finding in this study: that those born in the UK are more likely to feel a sense of belonging to Britain. The higher risk of radicalisation is generally seen to stem from young people’s frustration and confusion about the apparent incompatibility of the British and Muslim cultures they simultaneously inhabit. Yet 73% of respondents aged 25 or younger agreed that it is possible to fully belong to Britain, while maintaining a separate cultural or religious identity. And Muslims (and other non-Christians) were less likely to perceive such an incompatibility than Caribbean Christians. Indeed, complementary research suggests that much of the frustration among young British Muslims comes from a sense that their rights as British citizens to fair treatment and freedom of expression are not being respected. This frustration is not about being Muslim. Rather, it is about a lack of respect for their Britishness. Those who perceived themselves as at risk of victimisation were also less likely to personally feel part of Britain, or strongly belonging to Britain. Whether or not people have a sense of belonging to Britain is likely to depend on whether they feel accepted by British society. Negative attitudes toward Muslims are commonly presented by government ministers, the media and others. Worse, negativity towards Muslims has also been expressed in the form of verbal abuse, physical violence and other forms of social and economic exclusion, to which Muslims in Britain are increasingly and disproportionately exposed. This will directly affect their sense of acceptance, and in turn their sense of belonging within British society. Yet discussions of the “Muslim problem” generally ignore the role that the attitudes and actions of wider society may play in its creation. Indeed, the weaker sense of Britishness among women in this study may be in direct response to the particular ways in which Muslim women are targeted. Muslim women are often used as a symbol of the supposed dysfunction inherent in Islam. They are also singled out in government anti-radicalisation agendas and dress restrictions. Most recently, Cameron’s campaign has been criticised as taking a “lazy and misguided” approach to Muslim women. Conservative peer Baroness Warsi commented that linking English proficiency with the continuation of spousal visas was “a very unusual way of empowering and emboldening women”. 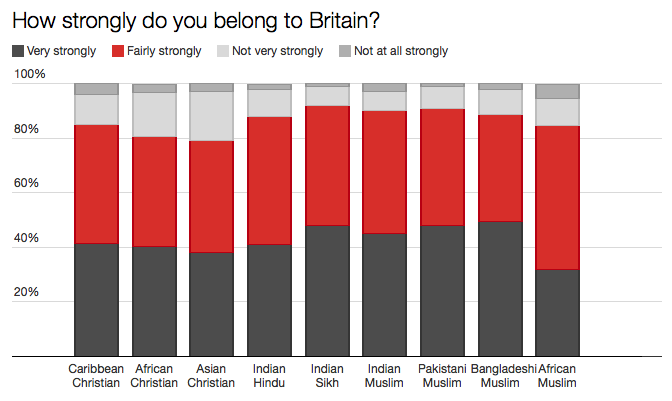 This research suggests that concerns about Muslim loyalty to Britain are misplaced. It also suggests that, as a society, we should think more carefully about how we engage with our fellow Britons. A proportion of the ethnic and religious minority population in Britain does run the risk of experiencing a sense of alienation, but this is unlikely to be addressed by improving language skills. Instead, it requires a more concerted effort to reduce the processes which isolate these members of our society. Questioning the loyalty of already loyal citizens runs a direct risk of making the “Muslim problem” much worse than it actually is. This article was originally posted on The Conversation. This entry was posted in Social change and diversity, Uncategorized and tagged identity, integration, multiculturalism, Muslims, social exclusion by policybristol. Bookmark the permalink.